The Bit Protector of this Beyblade is the Dark Emblem. This is the second mold version of Bit Protectors; which is tighter than its predecessors. Smash Leopard has small attack range due to its ABS Caul, which allows for more contact using the Metal Frame. Unfortunately this does not save it from being a sub-par AR. Its most effective use is in left spin where the slopes allow for some Force Smash (which compliments the RC). However these slopes are not nearly as pronounced as Advance Attacker (Advance Striker) or Eternal Survivor. In right spin, while it does have some Smash Attack, is even less impressive. Use of this AR is limited to Force Smash customizations. Smash Leopard shares the same metal frame as Smash Phoenix from Dranzer MF, and God Smasher from Shining God MS. Smash Leopard's main use is in Force Smash. This custom has a tall RC and heavy WD to make use of its abilities, though it is only effective in left spin. A deadly Smash customization can be created when combining Smash Leopard with Samurai Changer MS's CWD Part in Upper Mode. This custom has extremely high recoil and could potentially damage your Beyblade; so use this under your own discretion! To help with the recoil, using a grip tip is best to help it from self-KOing itself. The CWD of this beyblade is Needle Attacker. At the time of its release it was one of the better free spinning CWD rings. However over time its practical use was diminished with better competition on the market. The 8 spikes on this beyblade focus more on slowly shaving off the opponents’ endurance, but when compared to blades like Wolborg MS its effect is near negligible. Overall this CWD is generic and uninteresting, and there are no actual uses for it in a competitive situation. This is the highlight of the Beyblade and why it is in the Gimmick series. This RC is considered by many to be the spiritual successor to Dranzer V2’s Customize Clutch base. When initially launched Tornado Change Core contains a spring loaded tip which is pushed downward by tabs shifted inwards with centripetal force. This sharp tip causes the blade to spin in a single place much like sharp core. As the spin velocity reduces the tabs shift outward retracting the tip sending the blade into an offensive mode reminiscent of the Manual Change Core. While entertaining to play with its practicality in battle is another matter. 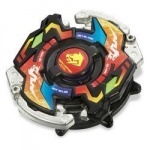 If the velocity of the beyblade drops too fast in battle it shifts into attack mode and circles around the stadium aimlessly wasting its energy before it can land a hit. Its best chance of winning is to outlast the opponent and avoid being hit until the end of the battle where it will change modes and land a couple of hits. Unfortunately in Stadiums like Tornado Balance Type S this is not practical. Similar to Dranzer MS’s Manual Change Core it suffers from being a tall RC with poor balance. For most attack styles this could be a major hindrance, except for Force Smash. When CWD Eternal Survivor is not available the use of Advance Attacker is a good substitute. Overall this blade is part of the gimmick series and was advertised as such. Hence it is important to take into consideration that it is not a competitive series blade like Death Gargoyle MS or Wolborg MS and should be viewed in that light (such as Phantom Fox MS). Tornado Change Core is the highlight of the blade and is fun to play with. The ease of use would appeal to younger players with no experience with shooting techniques. Unfortunately the AR and WD of this blade are not nearly as impressive as the RC and reduce the overall appeal factor. As a recommendation this blade should only be purchased by those with an interest to enlarge their HMS collection. Those who battle mainly in competitive settings, or those without very large HMS collections should skip this blade. This page was last modified on 28 August 2014, at 20:07. This page has been accessed 59,499 times.